Thanks Bart! I hope you and your family have a great holiday, you're the best! WOW tough one....I guess your gift to us was the "unlimited sugar" on level 24? Thanks again Bart! Bravo! So cool, so stylish, thumbs up once again Bart! Totally original, beautiful and amusing. Thanks Bart and happy Christmas. DONE! Looking forward to the next sugar sugar game. Best game ever ok, can't get enough sugar!! When is the next one coming out ??? Fantastic Holiday companion to your original version! Thanks for giving us such a fun and interesting gift, Bart! WOW that's awesome. Level 12 is HARD!!! Yay! I finished it! :D Great game Bart! And a Merry Christmas! WOOO! Thank you for the new bontegame! Thanks Bart -- very fun game! Totally stuck on level 4. Can anyone help please? Wispa: there are holes at the bottom and at the top. use them. Good game, Bart. Nothing quite like it out there that I know of, and worth playing through. Not too hard, but still takes a while to finish. 1. I'm not a fan of the single unit puzzles. Lots of pain for not a lot of gain. 2. Needs a new gimmick. Gravity is OK, but maybe some wind? Or moving obstructions? Or conveyor belts? Or doors? I'm sure you'll think of something. And I'll play it. This is awesome!! tks mate! Thanks for the present Bart...I love it! Jingle bells to you too. Your "sugars" are the best games out there! You are a creative genius. How about an Easter present or a 4th of July present? Great as always, Bart! Thank you!!! Merry Xmas to you all! Merci pour ce jeu, passe de bonnes fêtes!! Thank u for this game, have happy holidays!! Just like the original Sugar, sugar, this is my favourite game ever. So unique!! I love it - many thanks, Bart! Great X-mas and happy, sweet and fruitful 2012. I LOVE this game! Make more! Keep creating Sugar, Sugar games. f'ing love them. Hey Bart, what's your next game gonna be? Is it a Full Moon 2? I'm DIEING for a second one. Oh' and stuck on Level 10. 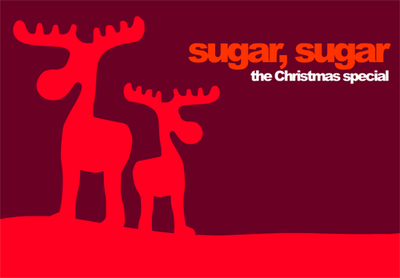 Great xmas variation of the original sugar, sugar music theme! Sugar,sugar is definitely one of the very few games where i leave music on while playing! A really great game which is great in everything :) Thanks Bart! Loved "sugar, sugar.." much!))) I played in all of.. Thank you!